Bonjour and welcome to our Art of the Home gallery of stunningly beautiful white luxury kitchen designs! We hand picked them just for you…hope you enjoy the visit! Antique white, pure white, creamy white, whitewashed, glazed white…should we go on? White kitchens play well with many kitchen styles. It will work whether you like a modern kitchen design, want to feel like you’re in Cap Cod year round or prefer the country elegance of a French country kitchen design. And in addition, white kitchen cabinets and kitchen islands will give your kitchen a fresh look and is sure to brighten your day. Below, we selected 20 white luxury kitchen designs that we thought you may like. Now with a white kitchen, you need to be ready to clean and dust your cabinets a bit more often. However, if you do it regularly, it should not be an issue. In the end, it’s worth it if white luxury kitchen designs cheer you up. What we love about white kitchens is that it allows you to add multiple color accents. This can be accomplished with paint, fabrics or decorations. Bonus feature, you can change these accents as your mood changes over time. And also, as you gather special accent pieces as you are travelling through life, you can more easily incorporate them to your kitchen if you so desire. With so many white kitchen options, something that would seem simple and straightforward can actually become somewhat overwhelming….we’ve been there. However, don’t worry — let’s enjoy the journey together. 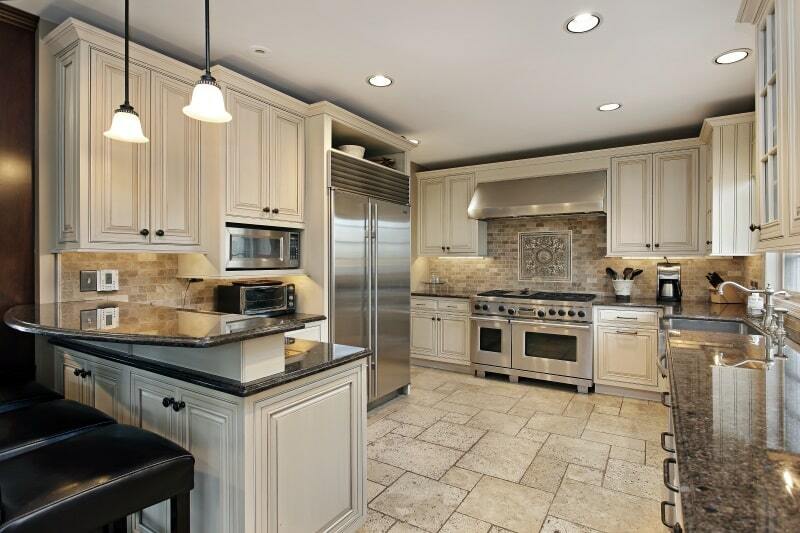 Just kick back and take a look at our photos of white luxury kitchen designs below. A few of them may resonate with you and help you share your kitchen story…in white! Enjoy and beautiful day to you! The Little Plus: the decorative plates are used in lieu of a medallion on the kitchen backsplash, very clever and beautiful. Also, the all around hanging glass cabinets let the natural light in. 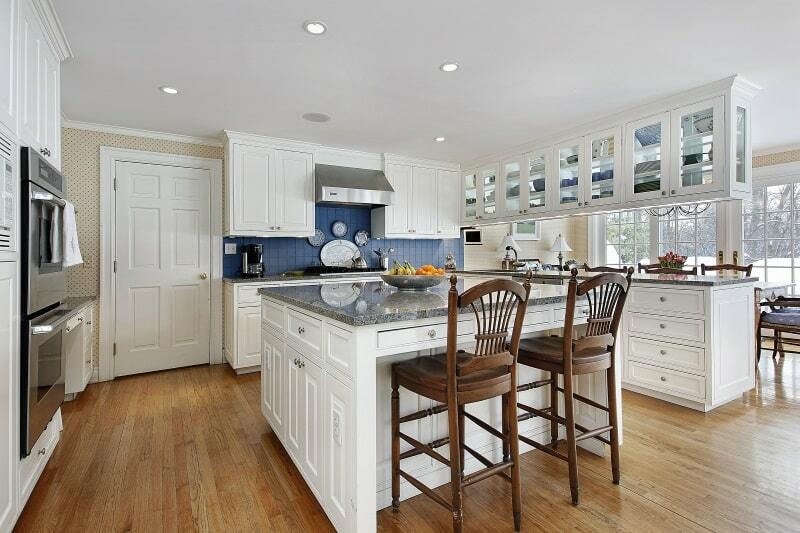 The blue backsplash, gray granite countertops, and blue seat cushions give a very peaceful feel. The Little Plus: a 21st-century version of a French castle’s walk-in cooking fireplace. Wow! 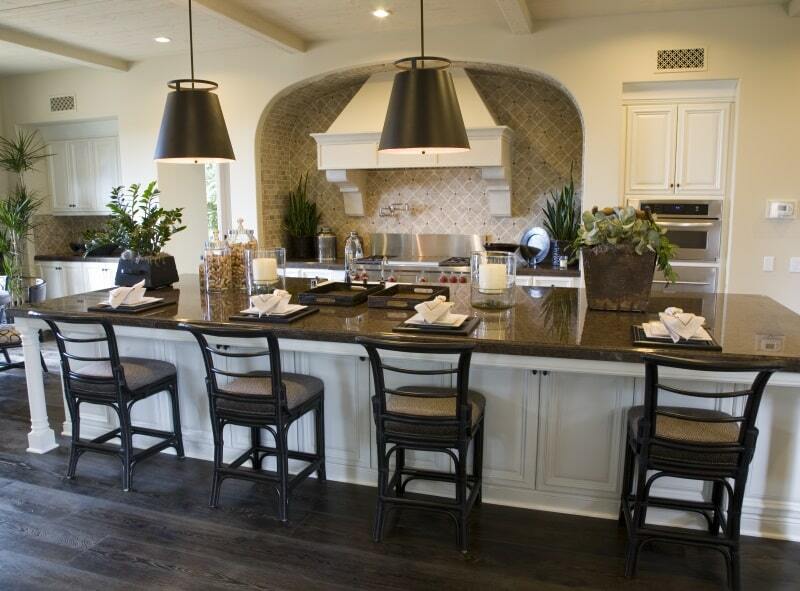 The dark kitchen island countertop and hardwood floor offer a nice contrast to the white cabinetry. Also, note how the built-in cabinets and appliances is an efficient use of space. The Little Plus: the unique pot hanger piece which calls back the solid wood vaissellier in the dining room and the rustic wood plank flooring. The marble countertop is so thick it looks like a butcher block type counter — how luxurious is that! Also, you have to love all the natural light being brought in through the five-panel kitchen windows. The Little Plus: the white cabinetry with marble countertops is a great match with the white porcelain farmhouse sink and white glazed subway tile backsplash. 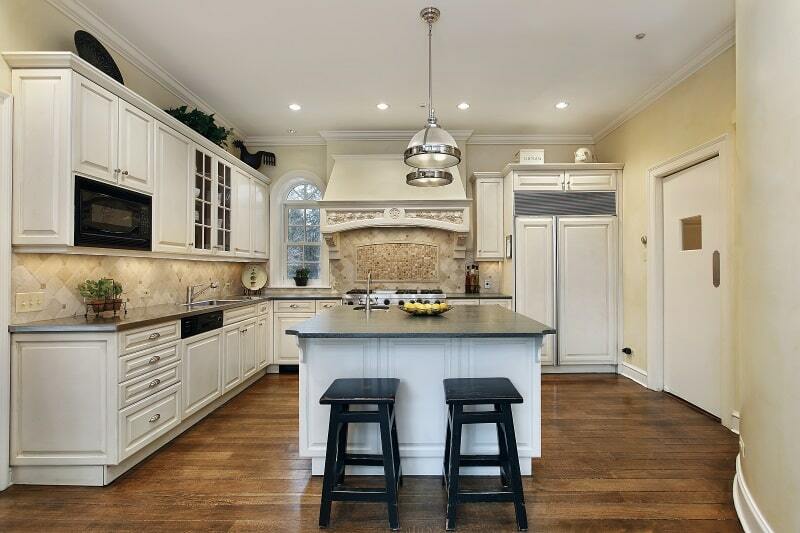 Also, the golden brown island maple wood countertop ties in beautifully with the hardwood flooring. The Little Plus: the earth-toned, tumbled stone backsplash with traditional square medallion. Also, using the dark brown accent wall adds a visual effect that clearly defines the kitchen space. The Little Plus: the oak hardwood floor plays well with this all white kitchen. 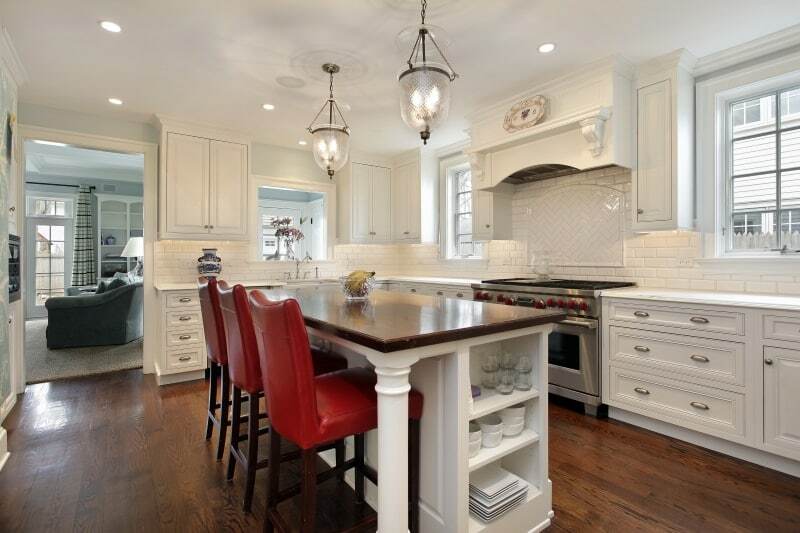 The marble countertops are gorgeous and the Bergere is a great liaison between the kitchen and the dining room. 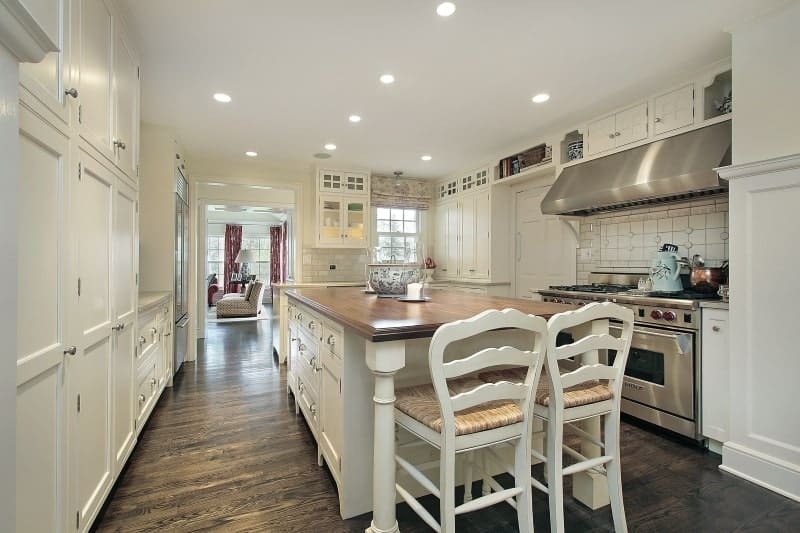 Also, love the globe pendant lights above the kitchen island — both sophisticated and practical.